Well friends, are you any more surprised than I am that I'm posting about cats again? no? good! Truly my crazy cat lady card was given to me quite sometime ago, so no need to sign me up. We found out that Waffles was pregnant about a month after my mom had come down to visit us. My cats are never allowed outside but somehow Waffles found an opportunity during that visit and got out. Needless to say the next day was filled with lots of tears and me and Ryan frantically scouring our neighborhood for her. Thankfully our neighbor helped us find her and she was unscathed. Well three-ish weeks go by and waffles starts to look slightly more chunky, 5 weeks go by and I knew she was pregnant. I was never planning on her having kittens, three is a healthy number of cats to have without people thinking you are utterly insane. Thankfully after her X-ray we were only going to be expecting two, not the 6 that Ryan was having panic attacks about, mostly because he knew I wouldn't want to give any of them up! After that vet visit we were told we had 24-48 hours to go before she was to give birth. Well two weeks later and me thinking that she was going to stay pregnant forever, she layed down next to me while I was opening up my laptop and started to have contractions. Yay!/OMG/THIS IS IT/AHHH! Within two hours she successfully gave birth to a baby boy and a baby girl. She had a little trouble with baby boy since he was breached but baby girl came out just fine. Waffles has been an amazing mommy and I still think when she looks at me she's psychically telling me that she can't believe she's a mommy. 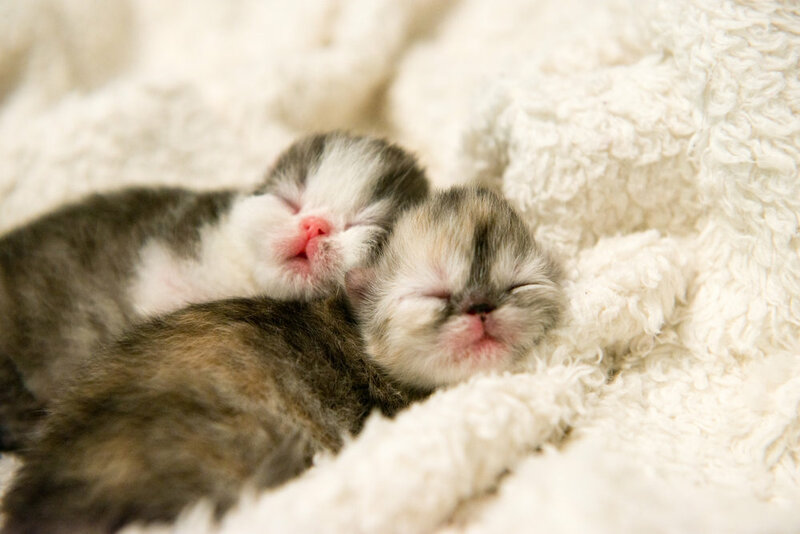 Despite them not being planned they are of course, adorable and I am so thrilled to have more babies in the family. It's always been my dream to have a mom and dad cat and their babies grow up together in our home, and even though Nizmo is the surrogate father, we're going to be one LARGE happy cat family! Our baby girl has the dark nose and gray coloring and baby boy has the beauty mark and looks exactly like his momma. She's still adjusting to motherhood and always gives me this look when I call her a mommy haha! Well it's happened, the holidays have snuck up to us once again! 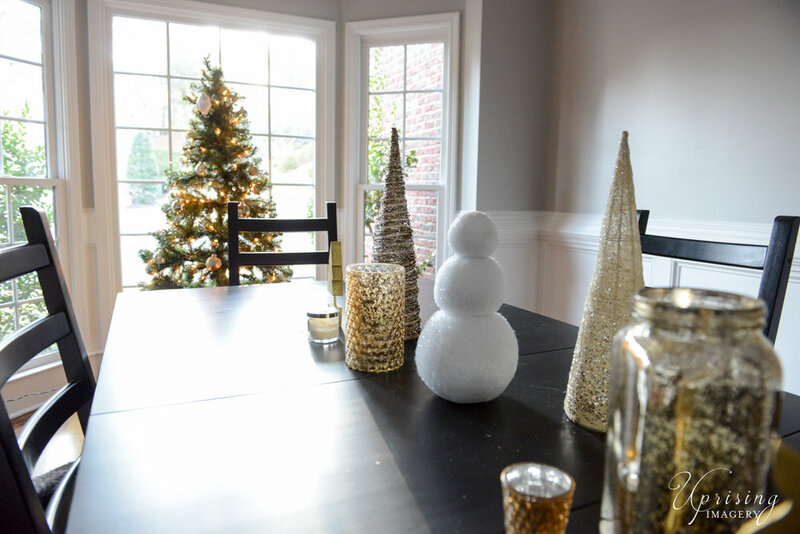 We're all decorated at home and ready for the festivities with Family. This is our first Christmas in our Georgia home and I wanted to make sure that we were truly feeling the holidays. We introduced the kids to Christmas ornaments since last year we were still packed up and house hunting during Christmas, and so far (Fingers crossed!!) we haven't had any break! I have lets just say...a couple of trees and they all have a bit of a theme going to them. I didn't put all of the ornaments up just in case any of the trees fell over, if you're curious about what I'm referring too, please youtube christmas with a cat, I promise you will not be disappointed. I thought I would share some of our decor and my favorite ornaments. 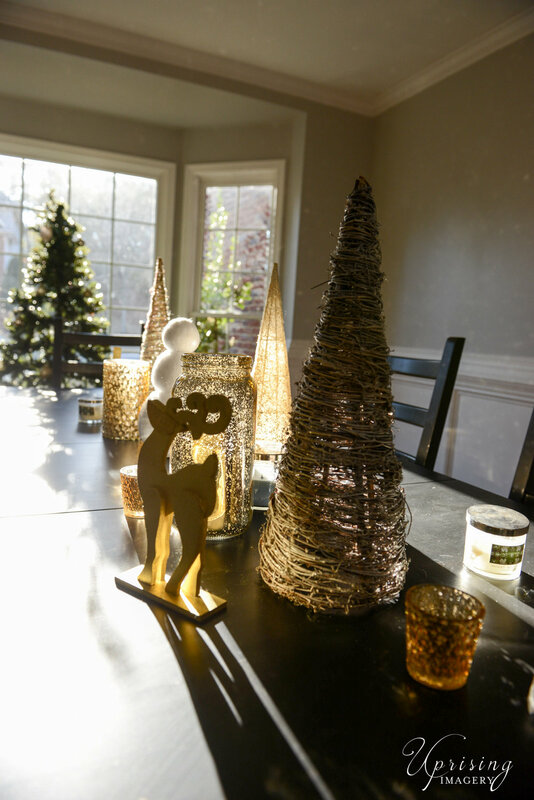 I love our dinning room when the sun comes through our windows, especially with all the glittery centerpieces we have reflecting light everywhere. This tree is more of the formal tree so there isn't a ton of sentimental ornaments on it. Our front room is still in the works but I do love this tree. It's filled with our fun character ornaments from when we were kids. My family loved the looney tunes growing up. My brother used to collect all of the tazmanian devil ornaments and I used to love Tweety bird. This ornament was my favorite. Mostly because of the heart shape and Sylvester as a stuffed toy. I thought it was the cutest, and still do. 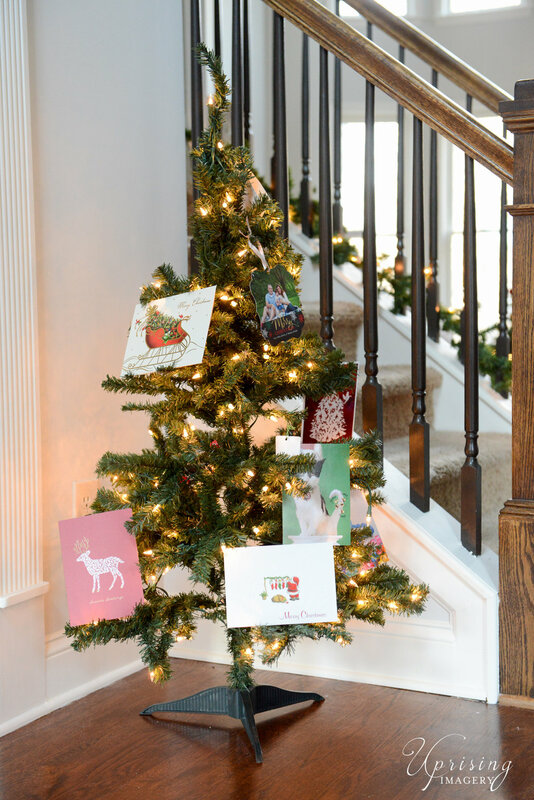 I always have one tree for christmas cards. I hate to see them tossed on a counter and would rather them be displayed as decor instead. 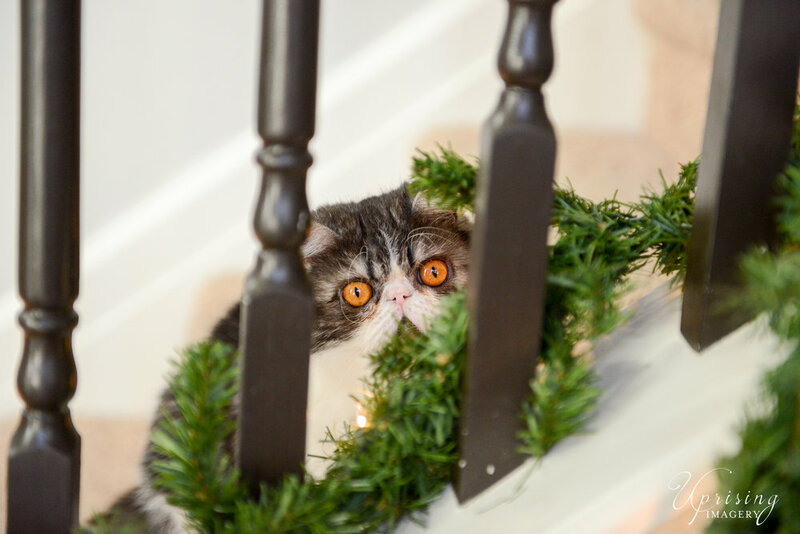 I couldn't help but show how cute Waffles was being while I snapped pictures of the trees! This next tree is our biggest and by far the more family and sentimental tree. It has all of our family ornaments. My favorite ornament is the first ornament Ryan ever gave to me. He surprised me on my lunch break with it the first year we were dating. It was by far the sweetest gift he's ever gave me and each year I always look for it as the first ornament on the tree. We don't do a ton of decorations outside but this wreath that my friends made for me is one of my absolute favorites! It's a cat snowman! He's got a tail!! I hope that everyone has a very Merry Christmas! Thank you to all of our friends and family for your continued support and for being there for us throughout these past years. We can't wait to share more of our adventures in the coming year!